Last Friday, March 23, Supreme Court Judge Pablo Llarena agreed to unconditional imprisonment for the candidate for the Presidency of the Catalan Government, Jordi Turull, the former president of the Catalan Parliament Carme Forcadell, and the “exconsellers” Raül Romeva, Josep Rull and Dolors Bassa. This Sunday, March 25, former President of the Generalitat Carles Puigdemont was arrested and imprisoned when crossing the German border in the direction of Belgium, in response to the European arrest warrant issued by the same judge, who has also issued arrest warrants against the politicians Antoni Comín, Meritxell Serret, Lluís Puig, Clara Ponsati, and Marta Rovira, who are in Belgium, Scotland and Switzerland respectively. It may be legal, but it is immoral for politicians to be imprisoned for their ideas without holding trials, while people tried and convicted for corruption and money laundering remain free. In protest against these imprisonments hundreds of protesters have gone out into the streets of the main Catalan cities: in Tarragona they have cut the AP7 motorway with slogans such as “Puigdemont our president”, in Sallent the “transversal eix” has been cut, in Girona they have manifested before the sub-delegation of the Spanish government and subsequently cut the AP-7 motorway, there have also been cuts in some Pyrenean towns such as Sort or Puigcerdà and in the south of Catalonia. 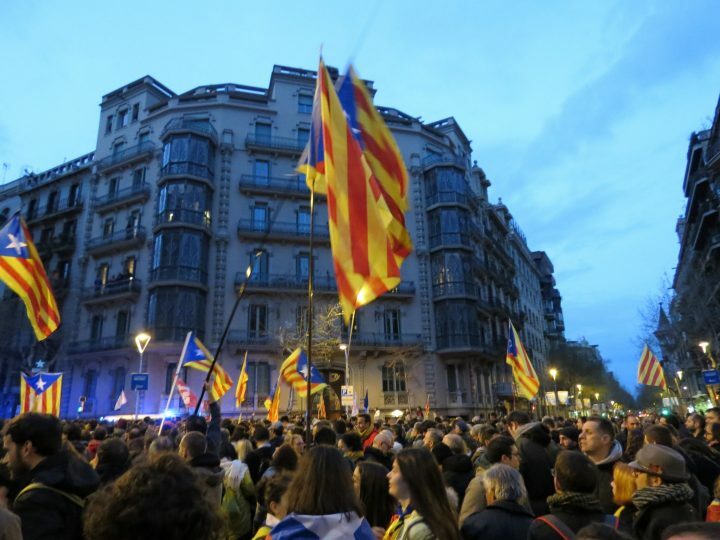 In Barcelona there was a mass demonstration presided by a banner of ‘llibertat political prisoners’, started before the European Union delegation and ended with the reading of a manifesto before the German consulate. 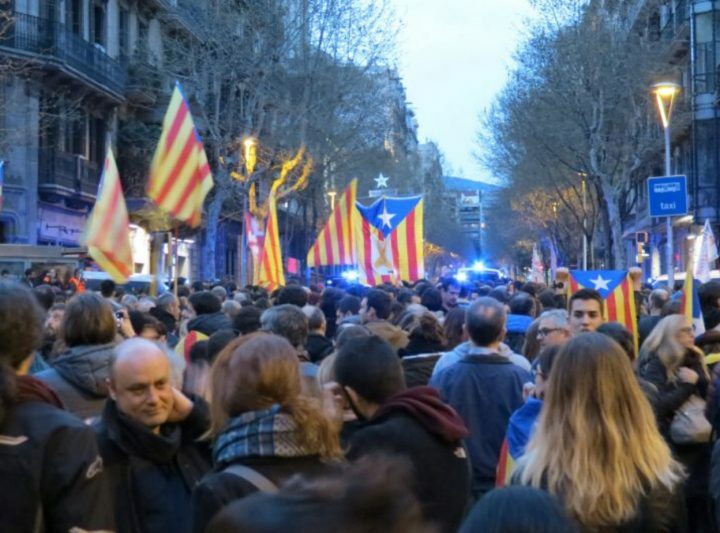 Also in Barcelona there have been demonstrations before the building of the Spanish government delegation in Catalonia. The president of the parliament has appeared in the media to deliver an institutional message asking citizens to respond with nonviolence to this outrage of the Spanish state, in the face of this democratic involution. He warns that Catalonia has become a laboratory in which the Spanish government can rehearse repression against any opinion contrary to its interests. It has also announced that it is working on a joint political proposal among all parties and entities to respond to the repression. He has insisted that the situation requires a political response and not a judicial one. In these moments the independentistas parties are considering three alternatives: general strike, permanent mobilization or immediate investiture of Carles Puigdemont.